Mass transit ridership is up, even as gas prices drop. Public transit ridership nationwide was up a record 6.5 percent in the third quarter this year, according to a new survey from the American Public Transportation Association . Dave Mumma chairs the Wisconsin Urban and Rural Transit Association and is director of the Janesville Transit System. Mumma says some riders may be getting back in their cars as gas prices drop, but many other people are riding public transit because they don&apos;t have an alternative, and that&apos;s unlikely to change even as fares increase. Meanwhile, transit operators are looking to Washington to help pay for much needed capitol improvements. Mumma says many Wisconsin transit systems have projects like replacing busses or new transfer stations, that would be ready to go if money were available. 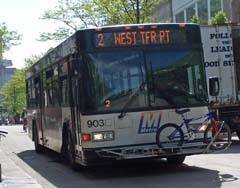 For example, he says Milwaukee Metro is well behind on replacing busses in its fleet.